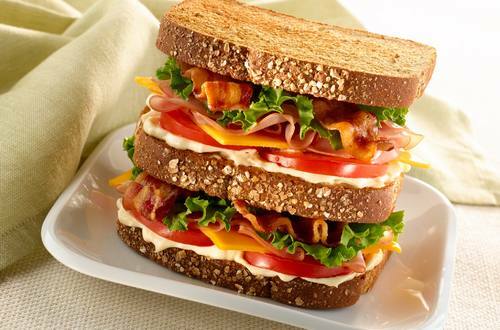 1 Spread one side of 2 toasted bread slices with 1 tablespoon Hellmann's® or Best Foods® Light Mayonnaise. Top one slice with 1/2 of remaining ingredients. Top with plain toasted bread slice, then repeat layers. Top with remaining toasted bread, Mayonnaise-side-down. Secure with wooden toothpicks and cut in half.